Trend Alerts finds new trends at the changing bar very fast. If the trend had enough power and good up/down angle, then indicator sends multiple alarms to aware you: email, mobile notification, alert window and alert sound. All of these alarms are optional and you can choose which one to work. Furthermore, there is another visual alarm, a Black bar. After trend direction change, the bar in indicator changes to black color. So you have 5 different signals and never lose a trend. 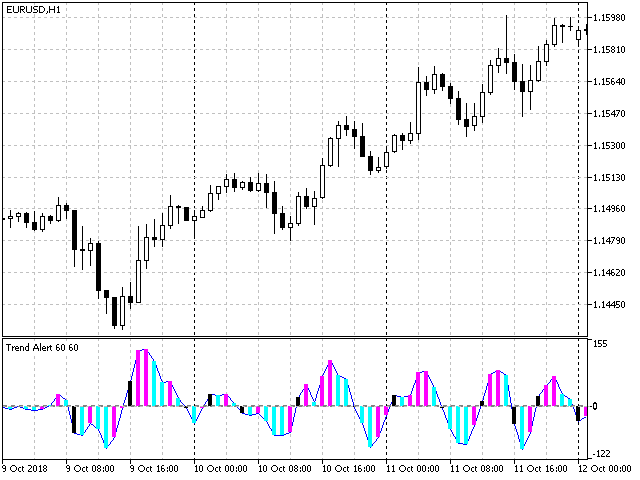 Trend Alerts has less sensitivity on short timeframes such as M1 and M5. Therefore select longer timeframes; like M30 and higher. Very good, even on smaller Timeframes as M20 or M15.